1. New car got 31 mpg around town on its first tank of gas. I know you've all been on pins and needles waiting for that number, so I'm putting it as the first item here, to avoid further suspense. They're Eckos. 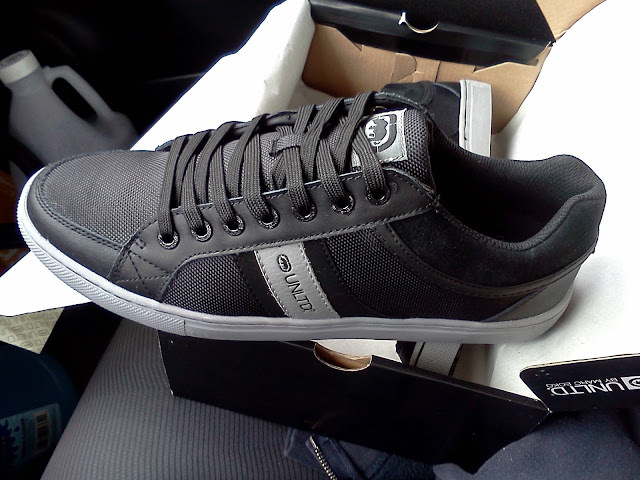 $50 at the downtown outlet store. That's probably the most I've paid for a pair of shoes in, oh, at least 15 years. Quite a splurge, eh? The last time I got new shoes (see post here) was three days before I met Cardgrrl. Obviously good things happen when I buy new shoes. What life-changing event will it be this time? 3. More progress on learning how to take care of my bike. Last night I took apart and put back together my front brake mechanism, then adjusted the position and tension. Neither of my two books was as helpful as I needed for this task, but I found a guy who does extremely helpful YouTube videos on bicycle maintenance and repair. His channel is here. 4. 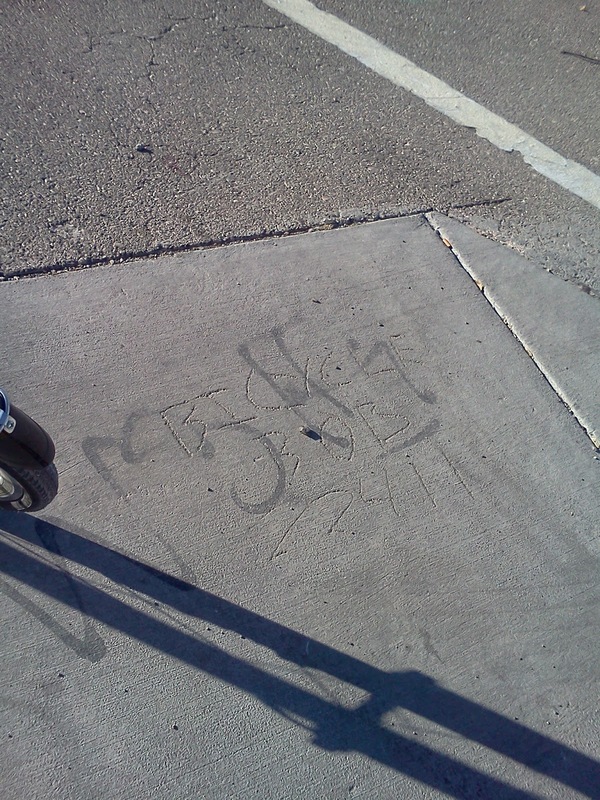 While out riding the other day I spotted a place on the sidewalk where somebody had etched "Bicycle Bob." I swear it wasn't me! NRS 484B.270 Vehicles, bicycles and electric bicycles: Driver’s duty of due care; additional penalty if driver is proximate cause of collision with person riding bicycle. 1. The driver of a motor vehicle shall not intentionally interfere with the movement of a person lawfully riding a bicycle or an electric bicycle. 2. When overtaking or passing a bicycle or electric bicycle proceeding in the same direction, the driver of a motor vehicle shall exercise due care and: (a) If there is more than one lane for traffic proceeding in the same direction, move the vehicle to the lane to the immediate left, if the lane is available and moving into the lane is reasonably safe; or (b) If there is only one lane for traffic proceeding in the same direction, pass to the left of the bicycle or electric bicycle at a safe distance, which must be not less than 3 feet between any portion of the vehicle and the bicycle or electric bicycle, and shall not move again to the right side of the highway until the vehicle is safely clear of the overtaken bicycle or electric bicycle. This is after roughly 12 hours of a steady drizzle, not one of the fast downpours that sometimes hit us. I'd really like to see what these washes look like after one of those. It's something I've never done in six years of living here. Next time it happens, I'm going. 7. In the morning I'm off to Salt Lake City for a family visit weekend. Who ya gonna believe--Bluff magazine or, um, Bluff magazine? I have been paying very little attention to the November October Nine this year. I recognize a couple of the names from watching the weekly ESPN broadcasts, but that's about it. I couldn't tell you who's in the lead, who's a good or bad player, or anything about their lives or personalities. Number of professional poker players among the October Nine. Russell Thomas (insurance actuary with Aetna Insurance), Michael Esposito (commodity broker), and Jacob Balsiger (student at Arizona State University), are the three non-pros at the final table. Russell Thomas is one of only three professional players at the 2012 World Series of Poker Main Event final table, though the other two have a bracelet to show for it.... He's primarily a cash game player, though he also has a full-time career working for an insurance company. So now we're being told that there are three professional players among the final nine, whereas the earlier article said there were six. Now we're being told that Thomas is among the three pros, but Ryan Lucchesi said Thomas was among the three amateurs. Confused yet? Hang on, there's more. The second profile is that of Jacob Balsiger. He is explicitly labeled as an amateur, with a decision to make as to whether to go pro after the WSOP ends. That concurs with the label given him by both Lucchesi and the writer of the Thomas profile. Ausmus, a Bellagio cash game regular, was considered by some to be one of the best cap game players in the world on Full Tilt Poker before Black Friday hit.... In 2005, he moved to Las Vegas to play poker professionally. It lists no job for Ausmus other than poker, and that description certainly sounds like they're considering him a professional player (as does everything else I can find about him), and he is one of the six that Lucchesi is calling a pro. But at the same time he must not be one of the three being dubbed a pro by the anonymous author of the Thomas profile, because he specified that the two professionals other than Thomas both had bracelets, and Ausmus has no WSOP wins to his credit. Next up is Steven Gee. No controversy here. He is explicitly labeled as a professional player and is also one of the two bracelet winners. Same story for Greg Merson--his profile dubs him a pro, and there seems to be no argument about this designation. He is the other bracelet holder, having won the last tournament before the start of the Main Event. The 24-year-old pro who originally hails from Massachusetts is having his first real taste of success in live tournament poker.... Sylvia is a cash game specialist who's had a lot of success online. Sylvia, therefore, is deemed a pro by his profile writer (no other job is listed for him) and by Lucchesi, but definitely not by the author of the Thomas profile. Twenty-seven-year-old Robert Salaburu primarily makes his living as a professional poker player who predominantly focuses on cash games, and if you think you're starting to see a pattern among the October nine, you might be onto something. Again we read nothing about any other job. He is considered a pro by his profile writer and by Lucchesi, but not by the writer of the Thomas profile. Koroknai is a 30-year-old professional poker player from Debrecen, Hungary.... Koroknai has been playing professionally for the past six years and he is proud to represent his home country at the final table. He attended the University of Debrecen and worked as a computer engineer before turning to poker. Again we have agreement between this profile writer and Lucchesi. But the author of the Thomas profile deems Koroknai an amateur, not a professional. On what basis? I do not know. Michael Esposito is a 44-year-old from Seaford, New York, who has two kids and works as a commodity broker in New York City. Esposito plays just a few times a year as a hobby. Here we appear to have agreement among the three different viewpoints I've been exploring: Esposito is one of the amateurs. To sum up: Lucchesi says that there are six professional players: Ausmus, Gee, Merson, Sylvia, Salaburu, and Koroknai. The author of the Thomas profile says that there are only three pros: Thomas, Gee, and Merson. And the nine profiles taken together judge seven of the nine to be professionals: Thomas, Ausmus, Gee, Merson, Sylvia, Salaburu, and Koroknai. You can also look at it by the player. There is agreement across the board that Gee and Merson are pros and that Balsiger and Esposito are amateurs. Thomas is dubbed a pro by the author of his profile but an amateur by Lucchesi. Ausmus, Sylvia, Salaburu, and Koroknai are all called pros both by Lucchesi and by the author(s) of their individual profiles, but are all considered amateurs by the author of the Thomas profile. Thanks for clearing that up for us, Bluff! An alert reader pointed me to this via Twitter--the winning hand of the ladies event of the Fall Poker Classic at Canterbury Park in Minnesota (where I used to play occasionally). See here. Conservatives were so busy supporting Bush's expansion of war powers that they let him betray their small-government principles in domestic affairs. Liberals have been so happy to see Obama expand government's domestic scope that they have let him betray their values on civil liberties and war powers. In the process, each side has come off looking like a bunch of partisan cheerleaders who care about certain issues only when it's politically convenient. That's the thing about principles. If you don't try to apply them consistently, then people are apt to conclude you don't really have any. Saturday night I was playing at Hard Rock. I had bought in for $200 and was up to nearly $400 when a hand came up the likes of which I do not think I have experienced before. I had 2d-2h in middle position. One of the several bad players at the table raised to $10 in early position. I called, basically set-mining. The guy two to my left also called. He was one of the only good players. He was rock solid, conservative, never bluffed that I could tell, never got his money in bad. The fact that I had observed this about him would prove to be crucial. The flop was 2s-8d-9d. Excellent! EP guy bet $45, an overbet of the pot. I estimated that he had about $80 left. I wanted to isolate him, so I raised to $125. But Seat 3 (I was in 1) called. Ruh-roh. I knew there was no way he would put that much money in with an overpair or with an ordinary draw. Two pair? Maybe, but he's not playing 8-2 or 9-2 after an early-position raise, so if it's two pair it's 8-9. Furthermore, I think he would reraise two pair here to defend against the obvious straight and flush draws. Or he might have a good enough read on me that he would fold two pair. So I was mostly discounting the two-pair possibility. I thought he either had a bigger set than mine, or he had a monster draw. I think the only draw big enough that he would call that much would be a straight flush draw. Specifically, Jd-Td, 7d-6d, or 10d-7d, in decreasing order of probability. Any of these would give him more than half the deck to make his hand. The original raiser also called. He actually had $84 left, so we had a $2 side pot. The turn was the Qs. Ugh. Tight guy's most likely draw just got there. If he didn't have me beat already on the flop, he probably did now. I checked. Seat 3 messed around with his chips for a while, stacking and counting and restacking and recounting. He finally settled on a bet of $250--basically about what I had left. I found it completely implausible that he would do this as a bluff or a semibluff. He had a made hand, period. And the only made hands he could have were a set higher than mine or a straight that had just been completed. If he had the former, I was dead to one out. If the latter, I would have ten outs to make a full house, but zero implied odds--there would be no more money to extract from him. It's painful to flop a set and see it go down in flames. It's even more painful to do so after investing $135 on it. But this was a clear fold. I thought the probability of him doing this with any hand that did not have me crushed (e.g., top two pair) was maybe 10% at best. With most other players, I would have to give this decision serious thought, because most others would stack off with enough lesser hands (e.g., pocket jacks) that I'd have to try to read whether they were as strong as they were representing. But with this particular guy, given all that I had observed about him over the course of a couple of hours, it took me less than five seconds to reach the conclusion that I had to fold. So I did. I was not a bit surprised to see him turn over 8-8. I was, however, surprised to see the original raiser turn over Q-Q. He had hit what he could not have known was a two-outer for top set, and won the pot. I don't think that I've ever been in a set-over-set-over-set situation. Heck, I'm not sure I've ever even seen one in live play. (I saw a flopped set/set/set in a televised tournament once.) It is a phenomenally rare occurrence. That I was able to figure out what was going on and therefore lose only $135 instead of my whole stack felt like the biggest win of the night. One of the reasons I went out playing early today was that I had been notified that the streets around my apartment building would be closed from 4 pm to 10 pm due to something called the "GlowRun." You can read about it here. I wanted to be back home before 4:00 so that I wouldn't be shut out for another six hours. Anyway, I was mildly curious what this odd thing was, so a short time ago I stepped out onto the sidewalk to take a look at the people going by. As you can quickly tell, this isn't exactly the most serious bunch of runners ever to pound the pavement. Now wouldn't that be a great campaign slogan? Why do I like Johnson so much? Well, I answered that in a fair amount of detail in that previous post, so I'll refer you to it. But here's the Reader's Digest condensed version. Radical cuts in federal spending in order to put us on a path of fiscal responsibility, before we experience a catastrophic economic meltdown from what I believe is an imminently looming combination of crushing debt, hyperinflation, and soaring interest rates. Maximizing individual liberties--especially, but not exclusively, those enumerated in the Bill of Rights. Strictly limiting the size, scope, power, and responsibilities of all branches of the federal government to those spelled out in the Constitution. On all three of these general issues, both Barack Obama and Mitt Romney are just unspeakably awful--so bad that it's impossible for me to say which of them is marginally better or worse than the other. I could not cast a vote for either one of them in good conscience. The differences between the two major-party candidates pale next to the fact that you can be absolutely certain that both of them would substantially worsen the nation's health on all three of my major points. Neither of them is even the least bit interested in cutting the federal deficit and debt. Neither of them gives two hoots about individual rights. And both of them explicitly tell us that they want to expand, not contract, the size and power of the federal government (though each in different areas). I won't stand for that--and I certainly won't vote for it. Conversely, all three are areas on which Johnson and I see eye to eye, and I believe him when he says that he would make these things among the top priorities and guiding principles of his presidency. 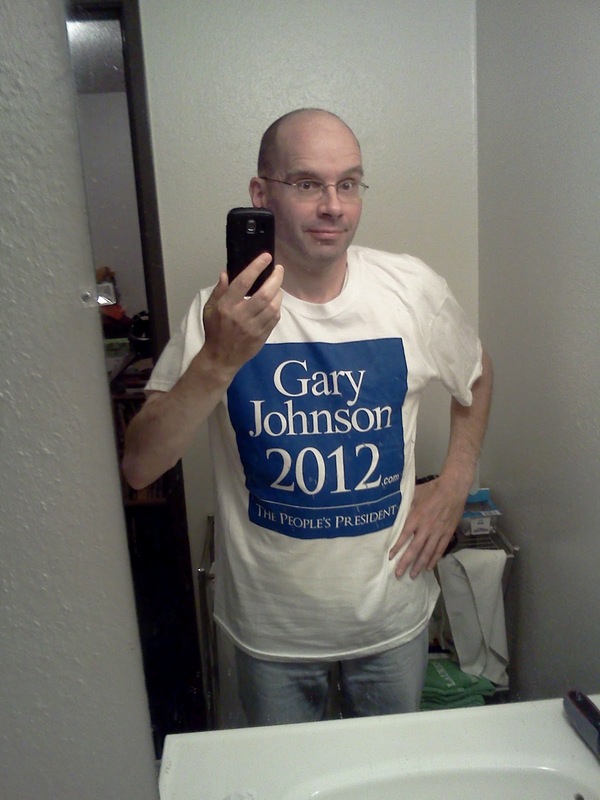 It is an added bonus that Gary Johnson is the only candidate explicitly calling for full decriminalization of online poker (which, of course, I'm legally and morally obligated to point out in a poker blog). The others won't. Both Romney personally and the GOP platform are opposed to online gaming of any sort. If Obama is in favor of your right to play poker from home legally, he's too much of a political weenie to say so, which means you can't count on him. There. I hope this mini-screed was worth the cost of a t-shirt to the campaign. P.S. Confidential to the Johnson campaign people: Were I in charge of things over there, I would consider adopting as a campaign slogan that great phrase from Lincoln's Gettysburg Address: "A New Birth of Freedom." That is what this country most sorely needs right now, and your guy is the only one who is interested in bringing it about.